Deputy Prime Minister and Minister of Finance Aso Taro's recent peculiar musings on the Nazi takeover of Weimar Germany earned him international scorn. 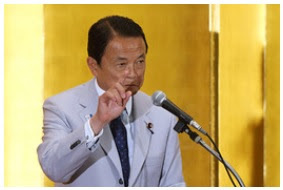 Aso-sensei also has a taut face topped with a mop of improbably black (he will be 73 years old on September 20) hair severely parted to one side (see above). The editors of Tokyo Shimbun, which published Mr. Takasaki's poem on the paper's editorial page on August 17, decided that of the 10 poems it published that day, this one was the most in need of a visual prompt. Dear Aso-sensei, after this, it might be the time for you to do the switchover to the full Shirasu Jiro look (I agree. It is hard to believe that the one on the left is your grandfather, when Shirasu on the right seems the closer match). You have the money and personal style to make it work. Besides, you can babble convincingly about wanting to be as close to your grandfather as Shirasu was (like in this photo of the two of them on the plane bound for the San Francisco peace conference) while remaining a conservative icon, which Shirasu is. Later - As for how it was that the internationalized Shirasu -- who opted out of serving the wartime government by taking up farming, returning to public service at the invitation of Yoshida Shigeru as a member of the Liaison Office facilitating the Occupation -- could become a conservative poster boy, see this Japan Times article. For the zenith of Shirasumania, see this poster of a Takarazuka production of his life. And look, Shirasu is wearing Aso's hat. And yes, the individual in the uniform is supposed to be General Douglas MacArthur. 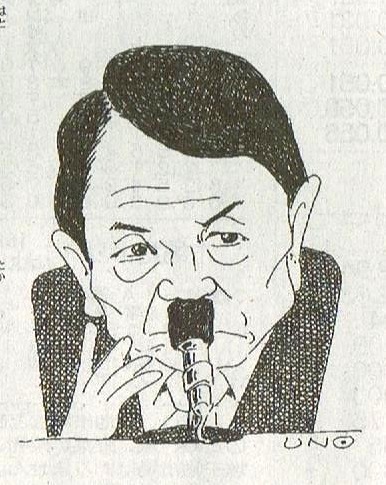 Beyond this be wonkery - Is there a specific use of "to write" (kaku - 書く) that applies for the penciling in of mustaches? I would have thought that "to draw, to paint" (kaku - 描く) would be correct character here. On 描く vs. 書く I think the former would be more appropriate. Though you can use 書く for symbols like morse code, icons, accents, and such 描く would be more appropriate for the more pictoral concept of drawing a mustache. Perhaps the author didn't want to leave room for doubt as to whether the word should be read with two syllables (かく) as to three (えがく).